Media Size: 2.5" x 8.5"
3" x 4" 3" x 5" 3" x 8" 3" x 11.5" 3" x 15" 4" x 5.5"
5.5" x 6" 5.5" x 9"
6" x 7.5" 6" x 8.5" 7.5" x 10"
Double-sided foam tape included for wall mounting. Suction cup provided for fast and easy graphic changes. Sleek silver coloring to easily coordinate with any professional environment. Durably built from anodized aluminum to endure for years to come. 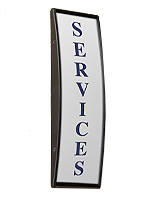 This lobby display, office sign for custom signage has a curved design to draw the attention of customers and guests. Each of the name plates comes with a non-glare lens for easy viewing from every direction. The lens also protects the prints from being damaged as well. 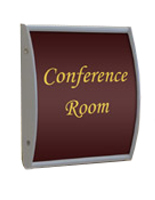 This silver-framed office sign features an anodized aluminum backer for durability and many years of use. 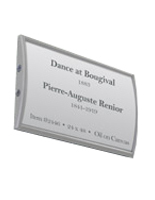 The silver finish of the name plates makes them perfect for use in any professional indoor environment. 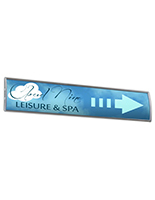 This office sign that is stylish, also called a custom signage frame, is an affordable way to show pertinent information such as room numbers, employee titles and department names to prevent visitors from getting lost. 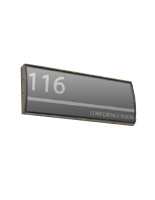 These nameplates are great for use in open areas such as lobbies, offices, airports, banks, hotels conference rooms and universities. Featuring double-sided foam tape, this office sign that adheres to a wall can be easily attached to any flat surface, in either vertical or horizontal orientation! 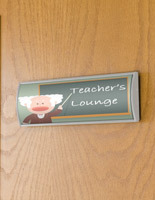 Door signage, like the one seen here, also permits fast and easy graphic changes. 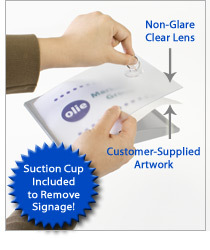 To change your custom artwork, use the provided suction cup to lift the non-glare lens and place your office sign underneath. 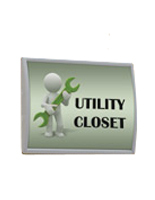 This design enables users to make custom signage changes without detaching the unit from the wall. Graphics are not included with each office sign. However, customers can easily create then print their own custom messages. The easy-to-use design makes this office sign perfect for users to update and change information. This wall signage frame can be used individually, or in multiples to create a wayfinding. 2.9" x 8.6" x 0.875"
This product worked out beautiful for our newly renovated office area. Very pleased with the results. Charlotte, we're so happy that these sign holders made a great addition to your newly renovated space. Thanks for the great review! I really like these signs. My only thing is that the plastic cover is not at "clear" as I would have liked. Almost has a texture on the inside which takes away from how crisp the text inside sign could be. They delivered quickly and were all set to install just had to insert the paper inside. Needed these for horizontal use on library shelves. 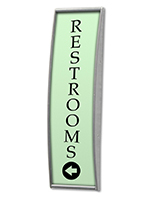 Great, easy-to-use product. We're glad the product works well for your library, Dave! Thank you for your order and taking the time to review -- we appreciate it! This product was easy to install and fit in well with the aesthetics of our company. The employees are extremely happy to have their work area personalized. Thanks for the feedback, Dwayne! It looks great! We appreciate you sharing the photo.